Just as surprising as seeing a strange dog roaming your yard, discovering that it is really a coyote can be an unnerving experience. All kinds of visions and “Ole wives tales” quickly well up through your mind: Little Red Riding Hood barely escaped from that wolf or your mind may return to childhood watching of Wylie Coyote nearly catching the road runner, you know what will happen if he does; Runner Fricassee! Our mind sometimes goes into action faster than the truth of reality. 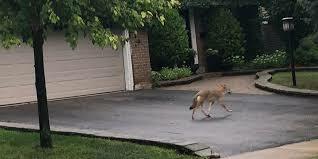 Coyote sightings are now the norm in most suburban areas in Ohio. It is even true that coyotes have roamed the alleyways in downtown Columbus and other highly traffic areas like the Ohio State Campus, almost always at night. But coming upon a coyote is becoming common place these days. Being instinctively afraid of humans, coyotes will avoid most contact but that does not mean you will not surprise one sniffing your outside trash cans or pet food containers. A coyote is in your back yard, what should you do? Here are a couple of tips from an article from the Ohio Division of Wildlife-Coyote that will help you deal living with coyotes as neighbors! 1. Understand that coyotes are common throughout Ohio’s 88 counties in both rural and urban settings. Note: there are no wild wolves living in Ohio, according to The Ohio Wildlife Center. 2. Identify that the canine is truly a coyote and not a stray dog. If you determine that the animal is a stray dog, contact your county dog warden. 3. If you do have a coyote on your property, remove all “attractants” to possibly deter the coyote from returning. This includes removing garbage and pet food before nightfall and cleaning up around the grill. Coyotes prey primarily on small mammals such as rabbits and mice. Small pets may also be taken. Keep small dogs and cats inside or stay with them at night when coyotes are most active. Coyotes are curious, but generally fearful of humans. Clap your hands and shout to scare off coyotes that are investigating your yard. 4. If the coyote visiting your yard seems to lack a fear of humans or is presenting a conflict even after removing attractants from your yard, contact a nuisance trapper. You can locate a trapper near you by calling the Division of Wildlife at 1-800-WILDLIFE (945-3543). Coyotes in rural areas can be controlled through legal hunting and trapping methods. Consult the yearly Ohio Hunting and Trapping Regulations booklet for more information. Go to www.wildohio.com to view more information online.